Stickers that are self-adhesive, designed for card making and scrapbooking, gift decoration and other paper crafts. Product Description: Embroidered stickers with shapes of tea and coffee cups and pots.Content: 5 different self-adhesive stickers.Material: Textile.Diameter: 31 a 38 mmSpecially indicated to be used in scrapbooking and card making projects. Product Description: Embroidered stickers with shapes of sewing tools. Content: 5 self-adhesive stickers in 3 different models. Material: Textile. Diameter: 31 a 38 mmSpecially indicated to be used in scrapbooking and card making projects. Product Description: Embroidered stickers with the shape of lighthouses. Specially indicated to be used in scrapbooking and card making projects. Content: 5 self-adhesive stickers (in 5 different models of lighthouse) Diameter: 32 mm approx. Material: Textile. 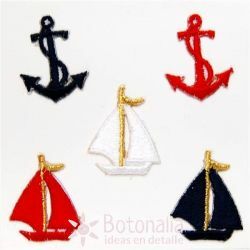 Product Description: Embroidered stickers with shapes of sailboats and anchors. Specially indicated to be used in scrapbooking and card making projects.Content: 5 self-adhesive stickers (2 different models in different colors)Material: Textile.Diameter: 32 mm approx. 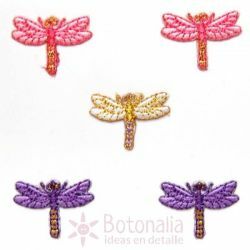 Product Description: Embroidered stickers with shapes of dragonflies. Specially indicated to be used in scrapbooking and card making projects. Content: 5 self-adhesive stickers (1 same model in different colors) Diameter: 27 mm approx. Material: Textile. Product Description: Embroidered stickers with shapes of cats and cat related stuff. Content: 5 self-adhesive stickers (5 different models)Material: Textile.Diameter: 30 a 35 mm approx.Specially indicated to be used in scrapbooking and card making projects. Product Description: Embroidered stickers with shapes of autumn leaves. Specially indicated to be used in scrapbooking and card making projects.Content: 5 self-adhesive stickers (3 different models)Diameter: 32 mm approx.Material: Textile. Product Description: Embroidered stickers with shapes of kitties. Specially indicated to be used in scrapbooking and card making projects.Content: 5 self-adhesive stickers (3 different models)Diameter: 27 to 32 mmMaterial: Textile. Product Description: Embroidered stickers with shapes of tools. Specially indicated for cardmaking and scrapbooking projects. Content: 5 different self-adhesive stickers. Dimensions: approx. 33mm. Material: Textile. Product Description: Embroidered stickers with shapes of musical notes and musical instruments.Content: 5 self-adhesive stickers in different models.Material: Textile.Dimensions: from 30 to 34mm.Specially suitable for card making and scrapbooking projects. 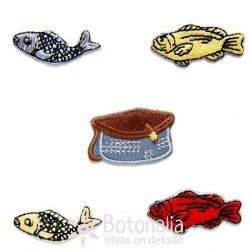 Product Description: Embroidered stickers with designs related to fishing and fish.Content: 5 self-adhesive stickers in different models.Material: Textile.Dimensions: from 30 to 33mm.Specially suitable for card making and scrapbooking projects. Self adhesive school labels (paper), with a joyful print, to mark books and other items. Content: 18 labels of 6 different models. Dimensions: 80 x 50 mm approx. Material: Self adhesive printed paper.